The Accomodating Pantry–what are your staples? | Don't push the river. The Accomodating Pantry–what are your staples? One of the things that I’m finding interesting about eating “whatever I want” is how many trips to the grocery store it necessitates. This isn’t because I have a demanding palate. I just have different pantry staples than many people. That’s what’s so interesting about kitchen necessities–they’re completely different for everyone. Me, I can’t sleep at night without flaxseeds and a well-mannered variety of dried beans in my cupboards. My friend, on the other hand, thinks that flaxseeds are some kind of extraterrestrial but won’t be caught dead without turkey breasts at beck and call. Once upon a time, I had an idea for a thesis. Compare the pantry of a woman, her mother, and her grandmother. Consider. I’m still intrigued. My mother was a baker. When I was growing up, we had huge bins of (white) flour and sugar on the shelf beside the deep freeze. We had chocolate chips (handy for sneaking), raisins, cocoa, cherries. Up until recently, I thought such things had no place in my house. After all, they’re unhealthy. They’re dangerous. You have to keep your eye on them or they might muster force and jump down your throat a dozen at a time. Sad as it is, I might somewhat sort of possibly still feel that way. But I’m getting really tired of writing off recipes because I don’t have butter and I don’t have flour and I don’t have chocolate chips. It’s one thing to health up a recipe once you know what you’re doing, once you know what it’s supposed to be in the first place. It’s another thing to force yourself through that third loaf of gluten free rice bread because you didn’t realize you couldn’t just substitute. Ahem. Anyway, I’d like to be the kind of person who eats oatmeal and guzzles kale wheatgrass spirulina smoothies for breakfast, but has no issue with a chocolate chip cookie after dinner. That’s what normal people are like. They don’t have to eat the whole batch. That said, I’m still very intrigued by vegan cooking. I like making delicious things that also happen to be good for my body and for the planet. I’m not going to try vegan gluten free croissants until I get down the technique for the regular ones, but I’m also not going to pass up a vegan gluten free cookie recipe. O no, I most certainly am not. I made these tonight after my Spinach a la Ottolenghi (I’m a little bit obsessed with him recently) and Baked Cod dinner. 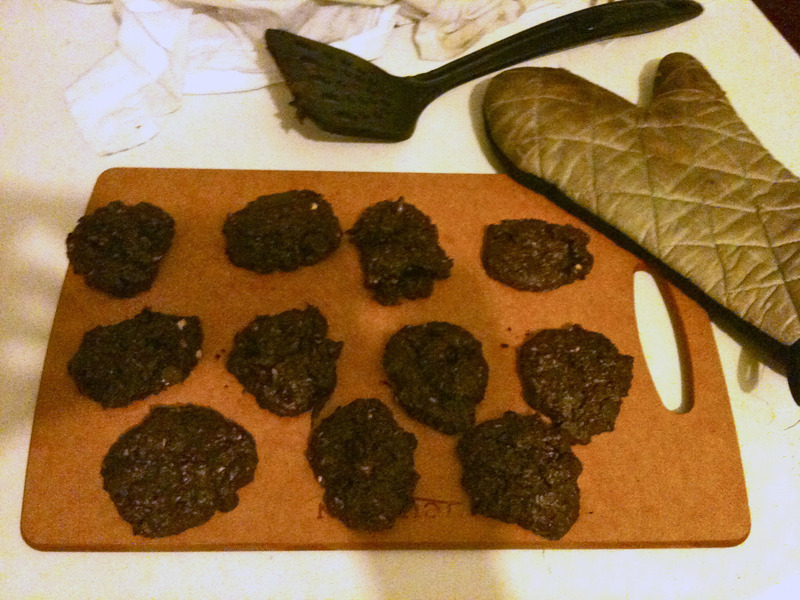 They’re a bit sweet for me, which may be because I got carried away with the chocolate chips. Next time, I think I’ll up the coconut and reduce the sugar. Either that, or find a way to sneak some kale into the mixture. Other than that, they’re pretty much perfect. This entry was posted on August 27, 2010 at 3:34 am and is filed under Uncategorized. You can follow any responses to this entry through the RSS 2.0 feed. You can leave a response, or trackback from your own site.